Raymond Mong, who died in the bus crash, pleaded guilty to the Connecticut hit-and-run, records show. FLUSHING — The preliminary report issued Wednesday by the National Transportation Safety Board into the deadly September bus crash in Flushing confirms what everyone knew when they saw the horrific video of the event: The driver of the private bus blew through the red light. The 56-seat bus, driven by Raymond Mong for Dahlia Group Inc., was traveling east on Northern Boulevard about 6:15 a.m. on Sept. 18 as the driver of an MTA Q20 bus was making a right turn from Main Street. Mong ran the red light, crashing into the back of the Q20 bus as it turned and causing the MTA bus to spin 180 degrees counter-clockwise, according to the report. It hit a parked car, which was empty, and that empty car crashed into another parked car, which had two passengers inside. After hitting the MTA bus, the Dahlia bus traveled up onto the sidewalk and crashed into a Kennedy Fried Chicken and other stores at 134-04 Northern Blvd., according to the report and the MTA. Surveillance footage taken from the scene and used in the investigation clearly showed the bus run the red light. NTSB's investigator, Robert Accetta, said a day after the crash that a preliminary analysis found the Dahlia bus was going between 54 and 62 mph — more than double the 30 mph speed limit on Northern Boulevard. The crash killed Mong, pedestrian Henry Wdowkiak, 68, and passenger Gregory Liljefors, 55, who was on the Q20 bus, officials said. In addition, the MTA driver, 15 MTA passengers, two pedestrians and two people in the parked car were also injured, according to the report. 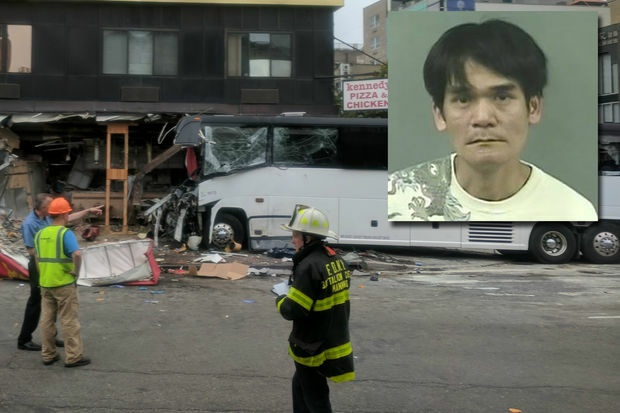 There had been 38 passengers on the MTA bus and Mong was alone on the motorcoach. Dahlia has a deadly history and Mong was working illegally for Dahlia after a 2015 drunk-driving crash. The NTSB is still investigating the crash and said the information is still preliminary.